Photo: The state of Illinois would like to move this property that sits opposite downtown Chicago. The colloquial “Damen Silos” harken back to an era when Chicago was a big player in the grain trade. The land on which the grain elevator lords over has been in use since the early 1800’s. In 1832 a fire broke out at the grain elevator and then rebuilt with with concrete. Disaster struck again on September 9, 1905 when spontaneous combustion killed several workers and consumed the entire building within an hour. Immediately thereafter architect John S. Metcalf was commissioned to build the current elevator. Photo (source): View of the grain elevator looking northeast. The John S. Metcalf Company, consulting engineers, designed and built this facility for the Atchison, Topeka & Santa Fe Railroad in 1906. The original complex included a powerhouse, elevator with temporary storage and processing silos, and thirty-five grain storage silos. With a 400,000 bushel capacity, this complex could accommodate sixty railroad cars at the elevator and 300 railroad cars at a yard a short distance away. Equipmentat the site included two driers, bleachers, oat clippers, cleaners, scourers and dust packers. Using filtered water from the adjacent South Branch of the Chicago River, boilers with a total of 1,500 horsepower generated the steam and electricity required bythemachinery. The thirty-five grain silos south of this facility had a total capacity of one million bushels. In 1932, a grain dust explosion ignited a fire which destroyed the original timber and brick building. 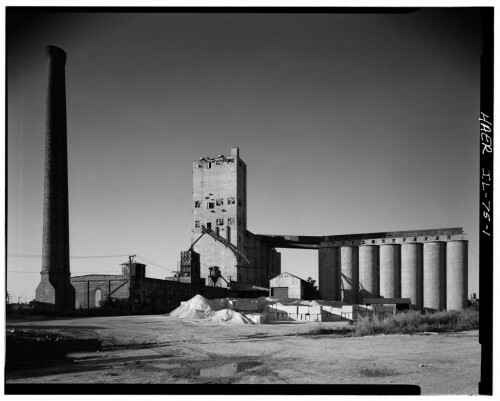 The Atchison Topeka & Santa Fe Railroad rebuilt the concrete processing house with fourteen reinforced concrete silos; the capacity of the facility was increased to 1,700,000 bushels. After reconstruction, the rail road leased the facility to the Stratton Grain Company. 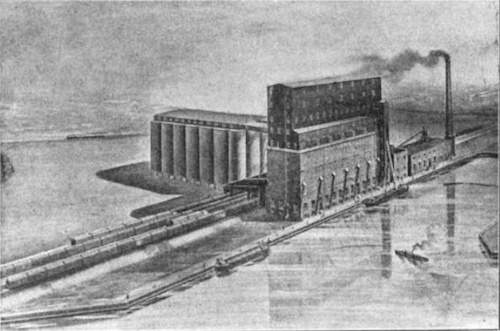 Photo: (source): Drawing of the grain elevator from around 1908. In 1977 another large explosion caused significant damage to the grain elevator. Afterwards the location fell into disuse and became property of the state. The real estate company charged with selling the property states “the property was owned by the state who wanted seventeen million for it and it didn’t sell. They have lowered it to eleven million, but they are only willing to sell it in one big chunk.” In this economic downturn it is highly unlikely that this waterfront property will move anytime soon. 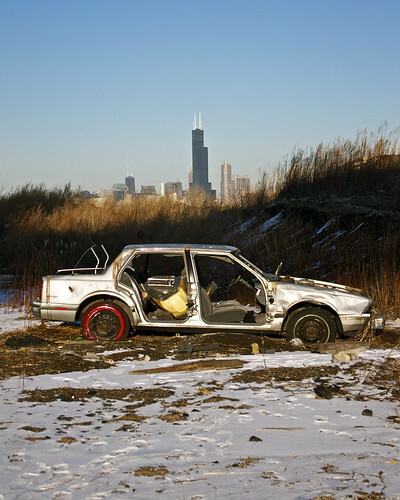 Photo: A lone abandoned Oldsmobile Eighty-Eight hides below the view of the Chicago skyline. The silos were the last location of the day during this urbex expedition. The sun was fast fading and we were a bit fatigued. Other urbex explorers have braved several stories of rickety stairs with missing platforms to get shots from the top of the cavernous silos. I wasn’t having any of that. I had already broken my tripod handle and slipped on some ice. My urbex partner lost a lens cap and broke his tripod leg. We were content with just standing in awe of the colossal monument to human industry. 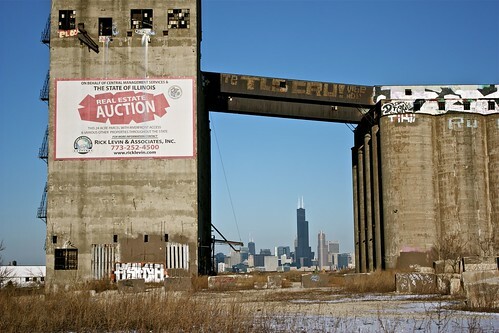 Flickr – My Abandoned Damen Silos set. GenDisasters – Excerpt from New York Daily Tribune about 1905 fire. Google Books – 1908 description of the grain elevator. Historic American Engineering Record – Description of location and photo inventory for the Library of Congress. John Hutton (PDF) – Thesis proposal for redeveloping the site. Library of Congress – 19 b&w photos of the grain elevator. New City – A brief history and quotes about the silos. I recently visited this site this past weekend. I was there with two fellow photographers. While there we ran into 3 more. We decided to climb the rickety stairs that lead to the top of the silos. The bottom four landings are missing but you can still balance yourself and reach the top. I had driven by these for many years…and i was finally able to explore them. It’s always cool when you run into other urbexers. I don’t have the stomach for climbing the silos though. I’m pretty clumsy. The amount of machinery that is located at the top…and over the 35 silos is amazing, you could easily spend hours here…this was the third location that we visited so we were pretty tired. Standing right over the silos gives you a sense of vertigo. There were people that braved the single rusted out ladder that lead down into the silo…evidence by the graffiti that could be seen at the bottom of some. Pretty cool and daring that you guys climbed up there! Some really nice and utilitarian information on this site, too I believe the style and design holds fantastic features. I have to let you know that vehicle was a film prop, and not an abandoned vehicle. I was part of a film crew that placed it there for a short. It’s no longer there. The pictures are still wonderful though! I was recently informed that a set of stairs that lead up to the top floor of the silos has been removed. This renders the upper area unreachable. Can anyone confirm this? Is there any other way to reach the top from the inside? If the removal of the stairs turns out to be true, than this is a major bummer! There is a way, but I’ve tried it and it’s very dangerous, but worth it. Someone placed a rope on the stairs that led up to he top. It’s behide the building, near the water. If you go there, you’ll likely see it. But be careful! to get to the ladder you have to find the entrance to get under the buliding itself and make sure yu have a flashlight! They gong to implode them today for the next “Transformers” movie. There ain’t no bridge anyone! Transformers 4 done blown it up!